My first colonoscopy took place at the hospital, so immediately after it was over, I was taken upstairs and admitted. Now, I’d never been sick in my life: being treated with antibiotics for a rash a few months earlier and chickenpox when I was 12 were the only other two times that I received medical care. This, of course, was on a completely different scale. I was taken upstairs to the pediatrics ward. The first — and only — book available to me when I was diagnosed at the age of 16. It was small, short, and didn’t contain much current information. Here’s the thing about being in peds as a teen: you’re not a small child, so much of what goes on there doesn’t help you. The staff is used to dealing with common childhood illnesses, and while IBD is not rare, I’d venture to say they didn’t see it very often. In the small community hospital where I was treated, I actually saw very few other children. Once a classmate was admitted for appendicitis and an appendectomy. She, of course, left after a few days. Other than that, I saw mostly young adults in the pediatrics ward. Maybe our community just had healthy kids, or kids who needed specialized care went into Detroit for Henry Ford, or down to Ann Arbor for the University of Michigan. When I was wheeled upstairs and they found me a bed, I was placed into a ward. Not a semi-private room, which typically has 2 beds, but a ward, which had 4 beds. This was 1989, and perhaps these types of wards aren’t used much anymore (and I hope they aren’t, I haven’t seen one since), but this is where I ended up. When you are admitted to the hospital for any reason, you get several different people asking you the same questions. By now I’m familiar with them, but at 16 they were absolutely hair-raising to me. What is your diet? (I don’t know, I eat regular stuff…?) Do you take any illegal drugs? (I’m sorry, what now?) Are you sexually active? (I’m only 16!) Could you be pregnant? (Hells, no, and why would you ask me that?) My mother was there to help me through this part, but it was still quite unexpected and certainly annoying, especially as I had fully expected to go home after my colonoscopy, not to take up residence. Things have changed now with HIPAA (Health Insurance Portability and Accountability Act) in effect, but at that time pretty much everybody heard your business. What if I were sexually active? What if there was a possibility of a pregnancy, or there was drug use? The other 3 residents of the hospital room I was currently in and all their guests would get to hear my life story. After the rigors of admitting, we sat. And we sat and we sat. And my gastroenterologist came by and gave me a book. Anyone who knows me or has heard me speak or has read my Twitter feed or my Facebook page will know about this book. 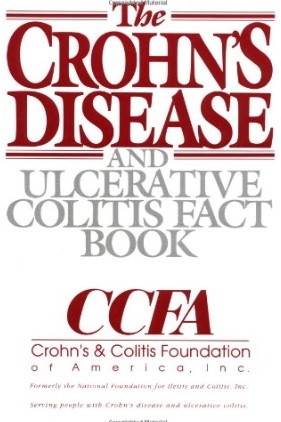 It was the one and only book available at the time for patients with Crohn’s disease and ulcerative colitis. It was put out by the Crohn’s and Colitis Foundation of America (CCFA), which at that time was called National Foundation for Ileitis and Colitis (NFIC). “Ileitis” is a now-outdated term that was used to describe Crohn’s disease. You’ll see it used in older literature and in historical references. So, it makes sense that the name was changed to the CCFA (although the word “ulcerative” is still missing, but I digress). 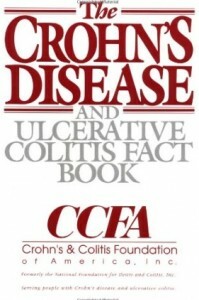 The name of the book was The Crohn’s Disease and Ulcerative Colitis Fact Book. It did contain a lot of information for the time, which still wasn’t much. Any book about IBD could only really scratch the surface. I’m not a verbose writer, I tend to be fairly concise, and I think I could probably sit down and write an entire series of books about IBD (given the time, inclination, and enough coffee). The book was reassuring in some ways, frightening in others. I suppose that’s true in the learning stage for any disease — there are the things you already know, the things you suspect, the things you should probably know, and the things you really don’t want to know. My take-away, quite honestly, and with apologies to my IBD friends, was relief that I had ulcerative colitis and not Crohn’s disease. The description of Crohn’s disease made it sound like cancer — you can remove body parts but it could just keep coming back. With ulcerative colitis, the book said that one could have ileostomy surgery and that would be the end of it. Do We Really Know All That Much More? So, the end result is that we only had this little book of information to go on. Other people made copies of medical texts for me later, but for patients who didn’t have relatives and friends in the medical profession like I did, this was it for information. It wasn’t much. We think we know so much more today. And I say “think” because in some cases we do know more. There are more advanced surgical techniques, there are drugs that can stave off surgery for longer. But there’s still much we don’t know. And we don’t even know what we don’t know. Are we that much better informed since 1989? Most would say we are. Gastroenterologists I talk to say that what we experienced in those long ago days won’t be replicated today. Patients don’t get as sick because we have better treatments. Remission is an actual possibility and not just a dream. Surgery is not necessarily inevitable. But I still wonder. How far away are we from another sea change like we saw in the change from “Ileitis” to “Crohn’s disease”? And what will that bring for patients? This entry was posted in My Diagnosis, My Story and tagged hospitalization, personal story, ulcerative colitis on June 29, 2014 by Amber.